The more we are accustomed to seeing something the less likely we are to appreciate its beauty. 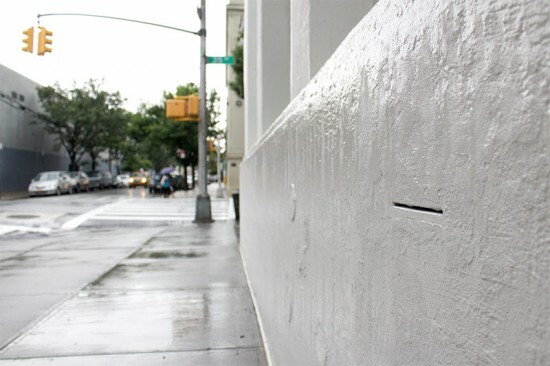 But not Karlis Rekevics, an emerging New York-based artist who creates complex white plaster sculptures that engage with the built environment and capture an often-overlooked urban landscape. Rekevics was selected as this year’s winner of the annual Clare Weiss Emerging Artist Award. 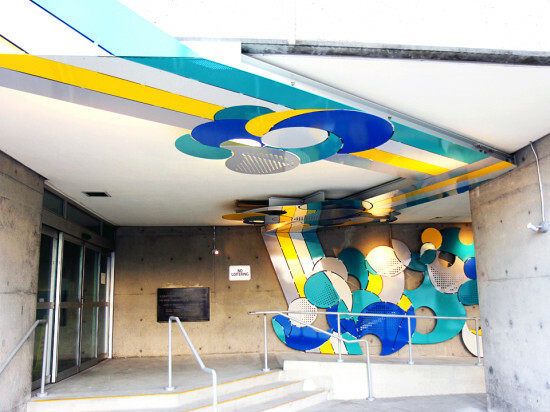 Clare Weiss, the former Public Art Curator for Parks, curated over 100 outdoor public art installations throughout the city. After her death in 2010 the Clare Weiss Emerging Artist Award was established to honor her memory. The $10,000 award is granted annually to one emerging artist who practices in a neighborhood typically underserved by public art. 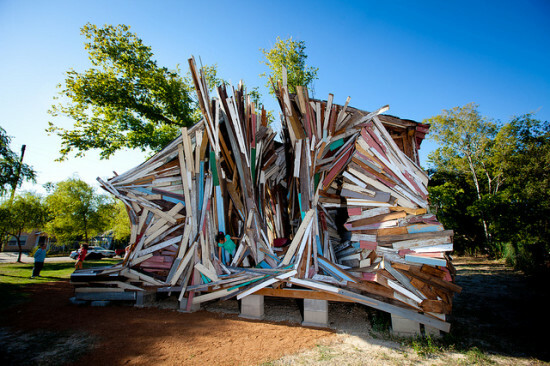 Rekevics was recognized for his All-Too-Familiar-Tangle, a sculpture that was built specifically for Tappen Park and honors the architectural history of Stapleton, Staten Island, an underdeveloped suburban neighborhood that is a mere twenty five minute ferry ride from Lower Manhattan. 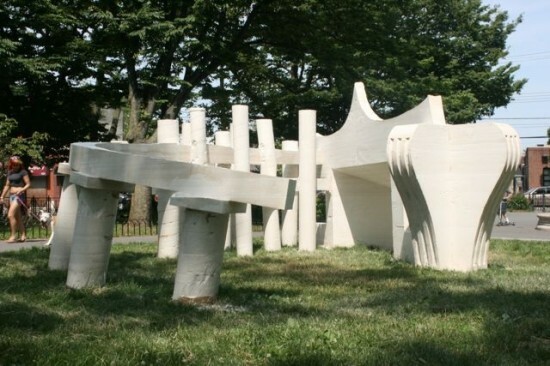 In creating the sculpture Rekevics was inspired by the local architectural elements surrounding Tappen Park that people rarely pay attention to. 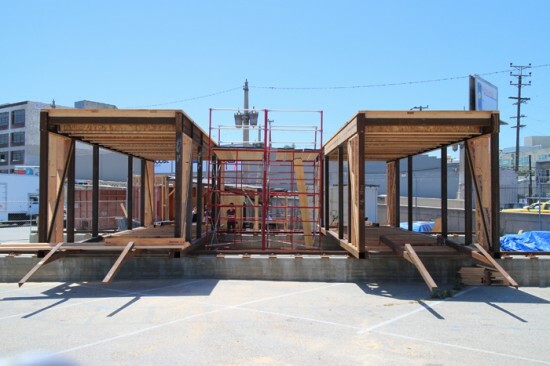 After carefully studying the different architectural forms, or the bones, that make up the suburban borough, like bridge supports, store facades, guardrails, signs, and scaffolding, he built a series of plywood molds and filled them with cast hydrocal (white gypsum cement) on site. Rekevics commented in a statement, “While the sculptures take their starting point from real places, they are more about the way that memory and my improvisational process transforms them into a new place with a physical and metaphorical language.” Rather than take identical cast molds of the forms Rekevics constructs them from memory; the outcome is a fragmented, subjective perception of the original form. 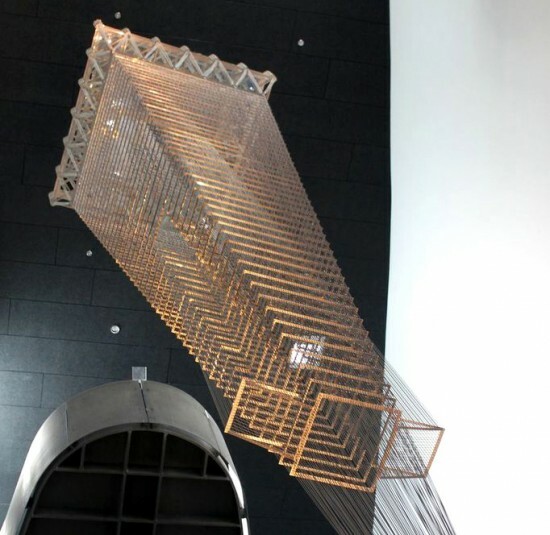 Rekevics then "tangles" the imperfect pieces together to form a single sculpture. Park visitors might see All-Too-Familiar Tangle and be reminded of things that they know they've seen but can't quite put their finger on, like the wooden bollards lining the coast near the Staten Island Ferry, the neo-classical limestone columns and rounded portico entryway of the Staten Island Savings Bank on Water Street, and the dormer window details from the park’s historic Village Hall. Rekevic's inventive sculpture is a rare celebration of Staten Island's architectural history. 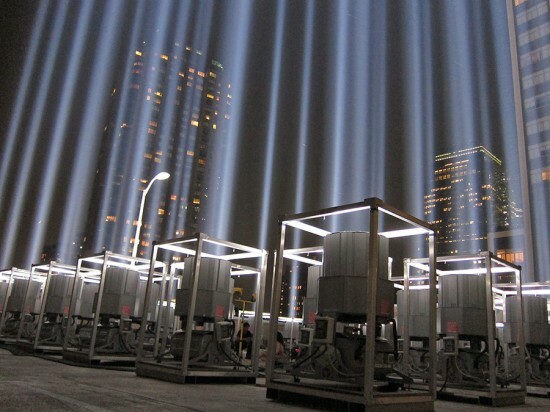 The sculpture will be on view in Tappen Park until June 2014. 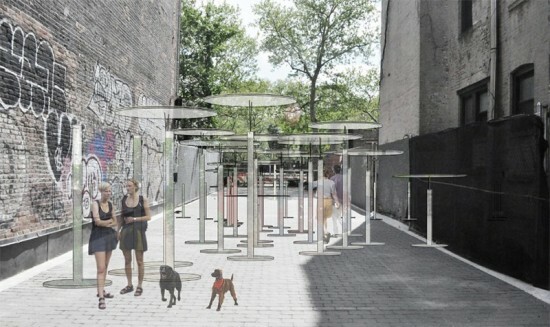 New York City-based artists and architects Jieun Yang and Ji Young Kim have secured a spot in First Park, located between East First and Houston Streets near Second Avenue, for a futuristic Urban Forest as part of the 2013 Public Summer installation program, overseen by contemporary architecture group SUPERFRONT. 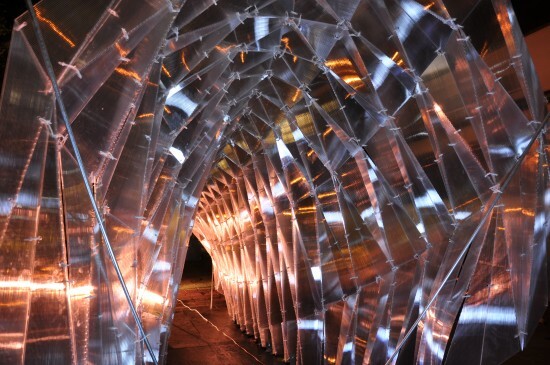 According to the group, "This program is sponsored every year by SUPERFRONT to provide an opportunity for young and emerging designers to produce a temporary installation in New York City while also fostering a community conversation about architecture and design." On May 19, SUPERFRONT in partnership with First Street Green hosted a competition to decide which artwork would occupy the space this summer. Although still awaiting approval from the Parks Department, the winning design will likely be installed from July through August and will be open to the public on the weekends. Urban Forest replaces tree trunks with mirrored poles and leaves with transparent panels to represent and reflect the movement and public exchange of the park’s visitors. First Street Green co-director Silva Ajemian explains that there is a “piece at the very top of each pole that is lightly held to the post so it waves a little bit with the air and atmosphere.” The project emphasizes the intimacy of physical contact and draws attention to the urban and community context. 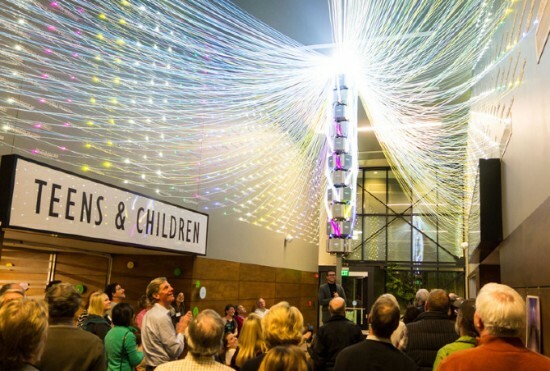 Yang and Kim’s installation will serve as a stage for events such as workshops, lectures and meetings managed by First Street Green. The temporary art project is flexible in that it can be raised to different heights. The site of First Park was, up until a couple years ago, an unused lot inhabited by rats. In 2011 the Guggenheim Museum brought its traveling “lab” to the park and the space has been transformed into a functional public space that serves the Lower East Side community. 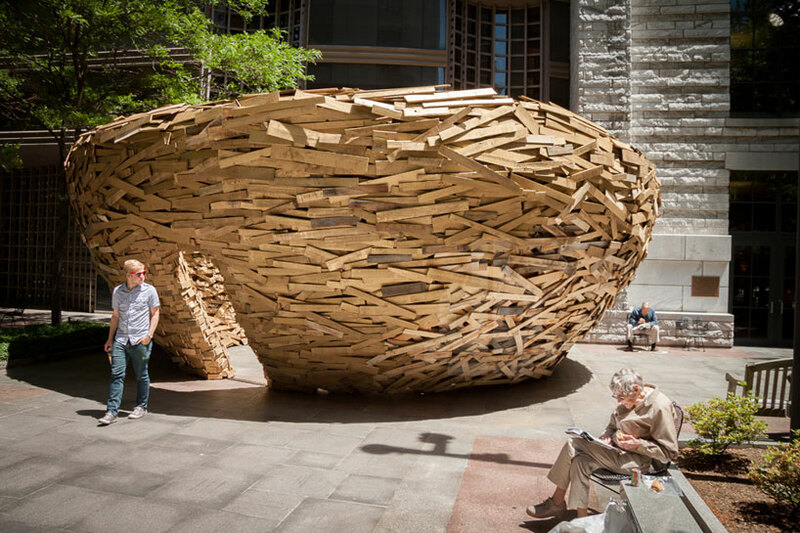 SUPERFRONT will plan events themed to the artwork and the concept of “urban movement.” The installation will be presented to Community Board 3 on June 13 and will require final approval from the New York City Parks Department. While you might not make a habit of visiting parking lots for the fun of it, if you haven't been to SCI-Arc's parking lot lately, you're missing out. Installations dot a big chunk of the concrete expanse, including Oyler Wu's billowing Storm Cloud installation, which was built for the school's recent graduation; the steel frame of P-A-T-T-E-R-N-S's gigantic League of Shadows installation, which will be done by September, and the wooden frame of DALE, SCI-Arc and Caltech's entry for the Solar Decathalon, which is being held this year at the Orange County Great Park. DALE, which measures about 600 square feet, has now been outfitted with steel tracks so that it can open up on wheels and provide outdoor spaces, including a small yard and even a reflecting pool. The furniture inside the net-zero home will also move to create varied spatial arrangements and configurations. DALE will be completed by September, then it will be reassembled at the Great Park by October 3. Some staff and students have complained about the lack of parking at SCI-Arc right now, which is understandable. But we hope this will become a regular attraction. Maybe they'll build a parking structure and make the whole parking lot an architectural display space someday? Trade shows are no longer simply product exhibitions: Education and networking sessions have become essential components to a show’s success. 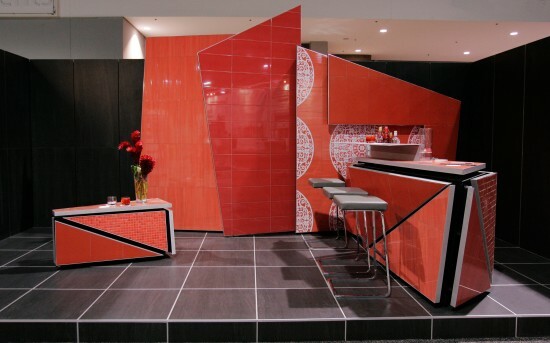 Coverings has expanded this formula to include installation vignette’s that, built over the course of four days during the show, demonstrate the versatility and variety of applications for ceramic tile. The Installation Design Showcase has paired four local, Atlanta-based design firms with four installation teams that have achieved the National Tile Contractors Association (NTCA) Five Star Recognition, and have been certified by the Ceramic Tile Education Foundation. Now in its fifth year, the teams will produce a bar/lounge; a hotel lobby; an in-patient room in a women’s birthing center; and a master bathroom, all designed to demonstrate the design possibilities of tile and stone. “These rooms are not all settings in which you would necessarily expect to see tile,” said Bart Bettiga, executive director, NTCA. “Above all, the Showcase highlights just how important the ongoing designer/installer partnership is to a successful project. Bringing the field to life in this way is another example of what makes Coverings a unique and valuable experience.” Bar/Lounge Michael Nieswander and Margaret Nysewander, ASD Inc. In the Bar/Lounge installation (above), designer Nysewander has called a bar of red tiles from Ceramics of Italy manufacturers “a conceptual art piece.” Highlighting the installation strengths of Rimrock Design, the bar’s design calls for varying cuts in the tile to produce unique textures across the surface. The lounge walls are clad in large-format, gray tiles with MAPEI installation products. Hotel Lobby Foreman Rogers and Allison Isaacs, tvsdesign For designers accustomed to working on large hotel lobbies such as the Hilton McLean Tysons Corner Hotel and the Gaylord Nashville, their challenge was to recreate spacious grandeur on a smaller scale. Using Plane, a 5- by 10-foot engineered porcelain ceramic wall panel from StonePeak Ceramics, the team recreates the luxury of Calacatta Borghini marble with a more thin, lightweight, and monolithic material at a fraction of the cost. A team of installers from C.C. Owen Tile Company, Inc. worked with the latest in large format tiles. Glass and mirror tile from Traditions in Tile are secured with TEC installation materials. In-patient Room in a Women’s Birthing Center Mary Porter and Craig Anderchak, VeenendaalCave Healthcare Italian wall tile that mimics a lightly colored fabric invokes serenity and relaxation, along with a warm, wood-look porcelain tile for the floor. “The porcelain tile from Italy will work well with the walls,” said Mary Porter. The David Allen Company set the porcelain with Strata Mat, a new coupling membrane from LATICRETE that creates a barrier between the tile and concrete for crack isolation protection essential to healthcare facilities. Master Bathroom Mark Williams, Mark Williams Design Associates Timely invocation of a 1920s Gatsby aesthetic coincides with Baz Luhrmann’s film release to define a masculine master bath with Art Deco undertones. Products from the Noble Company, TOTO, and Crossville are combined to create neutral walls, blue glass tile accents, and a herringbone-patterned floor. "We used color where we want you to look," Williams said. Collins Tile and Stone set Crossville’s ultra thin Laminam wall tile with MAPEI installation materials.